QUEENSBORO’ BRIDGE was built on the cantilever principle, but with no intermediate spans between the ends of the cantilever arms. All the cantilever construction is above the level of the deck which carries the roadway. The bridge spans the East River where it is divided into two channels by Blackwell’s Island, on which the central cantilever towers were built. MANHATTAN, New York’s great business section, is an island lying between the Hudson River and the East River. On the other side of the Hudson River is Jersey City, the terminal point of some of the most important railway systems in the Eastern States. On the other side of the East River is Brooklyn, covering the southern extremity of Long Island. Although the famous skyline formed by the giant skyscrapers rises from the crowded streets of Manhattan, it is Brooklyn that gives New York its vastness. Brooklyn stretches for miles. It has its business quarters, its shopping centres and its residential quarters. It is bounded by Long Island City on the north and by Coney Island on the south. Across the Hudson, Jersey City adjoins Newark. North of Hell Gate, where the East River communicates with the Hudson by the Harlem River above Manhattan Island, the city stretches out another great tentacle towards Yonkers. Thus the great city, which is probably the most remarkable in the world from the engineer’s point of view, is split up into natural boroughs - the local pronunciation is “burrows” - by these great stretches of water at the mouth of the Hudson. It is with the bridges across the East River, which divides Manhattan from Brooklyn, that this chapter will deal. By the middle of the nineteenth century the need for bridging the East River became urgent. New York was then rapidly expanding, but the intervening reaches of water kept each part of the city remote from its neighbour. In those days there were no underground railways such as the Interboro’ Subway or the Hudson Tunnel. The Manhattan business man with an appointment in Brooklyn had to allow a good deal of time for travel between his office and that of his colleague or client across the water. He had to take a cab or tramcar down to the waterfront, and there wait for a slow steam ferry boat. Those who lived somewhere on Long Island, as many did and still do, had to allow an extra half-hour or so on their journey to the office every morning, and that half-hour was caused by the unavoidable gap made in their route by the East River. In the ’fifties engineers suggested the possibility of building a bridge across the East River between Brooklyn and Manhattan. It was to be a bridge such as the world had never seen before. The United States War Department insisted that the bridge, which was to be exceptionally long, should allow a clear headway of 135 feet for the passage of shipping along the East River. This stipulation applied not only to the finished structure, but also throughout the period of building. The engineers might build their bridge, but they were forbidden to erect any falsework or other temporary building from the bed of the river itself. The bridge was not to be built across the river; it was to be thrown across. WILLIAMSBURG BRIDGE, the second structure to be thrown across the East River, was completed in 1903. Clear headway of 135 feet was stipulated by the United States War Department. The bridge was built on the suspension principle, with a span of 1,600 feet. At the time of building this span was exceeded only by the Forth Bridge. The Williamsburg Bridge is 118 feet wide. The father of the project was that great engineer J. A. Roebling, sponsored by William Kingsley, a prominent New Yorker of the ’fifties and ’sixties. The War Department stipulation ruled out anything in the form of a viaduct, such as that which spans the great width of the Tay at Dundee, Scotland, to-day. The bridge was to clear the East River in one sweep. This could be made possible by one of two methods only, the cantilever bridge, or the suspension bridge. The steel arch - first cousin to the cantilever - was ruled out by the limited amount of headway allowable underneath. The bridge in which the deck is supported by a steel arch from above, of which the Tyne Bridge at Newcastle and the great structure at Sydney Harbour are examples, was then a thing of the future, except in some bridges of small span. The ordinary cantilever bridge, in which the main span is supported by two huge brackets, was also more or less novel in its application. Cantilever construction is old enough in principle; independently of each other, peoples as far apart as the Mongols of China and the North American Indians had invented and built small cantilever bridges. But the big cantilever bridge was another matter. Many years were to elapse before Sir John Fowler and Sir Benjamin Baker were to produce the Forth Bridge, one of the first giant bridges on the cantilever principle. Thus there was no practicable alternative to the suspension bridge. As with the cantilever, the suspension bridge is of ancient origin. It was known to the Incas of Peru and to the Himalayan peoples. Moreover, the modern suspension bridge, in which the woven osier suspension of primitive engineers had given place to steel cables or chains, was well established in the middle of the nineteenth century. Telford’s Menai Bridge was then world-famous and already old. Suspension bridges had also been set up in various other parts of the United States, and although there had been some failures, generally through neglect or because of the use of unsuitable material, such as cast iron, there was no doubt that they had, on the whole, been successful. It was the suspension principle, therefore, that Roebling adopted from the first in his designs for the great Brooklyn Bridge across the East River. Although other giant bridges have since come to connect Brooklyn with Manhattan, the name “Brooklyn Bridge” to this day signifies one of them only, the pioneer structure designed by Roebling nearly three quarters of a century ago. THE SUSPENSION CABLES of Manhattan Bridge support two decks and consist of 30,000 strands of steel wire. The cables are suspended between two steel towers. Manhattan Bridge was completed in 1910. It rests on caissons sunk in the river bed. A company was formed in 1867 for promoting the bridge, with Roebling as Engineer-in-Chief. At first, he thought he could complete the work in the course of five years, but various circumstances made this impossible. Nothing on a similar scale had ever been attempted before and many people were apt to underestimate the difficulties presented by this project. Not until Roebling had prepared designs which took the roadway across the river at a maximum height of 130 feet did the Government authorities step in and stipulate that this must not be less than 135 feet. Then again, the local municipal authorities of New York and of Brooklyn were not always in harmony. There were several hitches in the technical progress of the work. Roebling originally intended to base his piers on piles driven down into the bed of the East River, and to provide approaches to the bridge at either end by means of light iron truss spans. Pile-driving in the river bed was found to be impossible at this point, after a few trial borings had been made. The only possible means of founding the piers was by the now well-known system of sinking caissons on to the bedrock, filling them with compressed air, and building up the foundations inside them. The iron truss spans were disallowed for the two approach viaducts, and heavy masonry structures had to be substituted. In his original design, Roebling had arranged for the bridge to carry an 80-feet roadway for ordinary vehicles and tramcars. This width he later increased to 85 feet, the traffic lines being arranged in a remarkable manner. It was not exactly a double-deck bridge, in the modern sense of the term, but it anticipated the double-decker of later years. In the middle of the main deck there was provided a raised footway 15 ft 6-in wide. On either side of this, at main deck level, ran the tramway, or “car track” as it is called in New York, with up and down lines. Outside each tramline, nearest the parapets, was a 19-feet carriageway for ordinary road vehicles, which in those days were all horse-drawn. The trams were part of the bridge’s equipment. They were worked by cables, as were the Edinburgh trams in former years, and ran a shuttle service backwards and forwards across the bridge between terminal stations in Manhattan and in Brooklyn. These old cable cars survived until 1908, when they were removed to give way to elevated railway trains, connexions with these “L” routes having been put in during that year. The building of the bridge was finally authorized in 1869, and preliminary operations were started in the same year. Then the great work claimed its first sacrifice, in the person of its designer. John A. Roebling, the father of all giant suspension bridges, never lived to see the fulfilment of his masterpieces. The master engineer’s son, Washington Roebling, stepped into the vacant position and carried on the task. The first big operation consisted of building the two caissons for the great piers and towing them into position. The caisson on the Brooklyn side was ready to be placed in position in May 1870. Then fire broke out in its internal falsework, and the caisson had to be flooded to extinguish the fire. The accident caused a delay of two months in the sinking of the caisson and in the subsequent erection of the pier on the Brooklyn side. The caisson was finally in position by March 1871, when a start was made with the building of the pier above it. The Brooklyn caisson rested on a bed of hard clay approximately 45½ feet below high-water level. The Manhattan caisson, even in the absence of such an accident as that which had overtaken and delayed its fellow, presented more difficult problems. The immediate stratum below the bed of the river at this point was not trustworthy, and the younger Roebling had to sink his caisson down to a depth of 80 feet below high-water level, so that it rested on the virgin rock on which New York is founded. THE EAST RIVER separates Manhattan Island from Brooklyn, which is the southern part of Long Island. Brooklyn, Manhattan and Williamsburg Bridges link Manhattan and Brooklyn; Queensboro’ Bridge, built across Blackwell’s Island, connects Manhattan and Queens, also on Long Island. The most recent of the bridges across the East River is the Triborough Bridge, which links the Bronx with Manhattan and Queens. Working far down below the level of the river, in the compressed air of the caissons, the men suffered badly from “bends”, or compressed-air sickness. In an effort to prevent harmful effects, each man leaving or entering the caisson had to pass through an air-lock. When he entered the air-lock to begin work, the pressure was gradually increased to that in which he would work at the bottom of the caisson. When he left, the process was reversed. This practice has long been observed in the building of caissons for bridges and similar structures. Even so, no fewer than 110 of the workers on the Roeblings’ Brooklyn Bridge suffered through working in the atmosphere of the caisson. These included Washington Roebling himself, who was thus unable to superintend in person the great task of erecting the superstructure. After the placing of the two great caissons, the suspension towers rose upon the foundations provided by them, and began to give some outward idea of the magnitude of the bridge. The builders carried each of these towers up from high-water level to a height of 118 feet. At this point each tower was divided into three smaller pillars, forming two openings or Gothic arches, each 31 ft. 6 in. wide. These arches rose to a level of 238 ft. 6 in. above high water, the arches themselves being thus 120 ft. 6 in. high. Through them passed the carriageways and car tracks, one of each to an arch, the elevated footway being carried round the central pillar. The towers continued above the tops of the arches for a distance of 30 feet, and contained saddles for bearing the bridge cables. The full height of each tower above high-water level thus came to 268 ft 6-in. The towers were 1,595 feet apart, this being the length of the clear river span. The New York or Manhattan Tower contained 46,945 cubic yards, and the Brooklyn Tower, with its shallower foundations, 38,214 cubic yards of masonry. The building of these two suspension towers was not the only great piece of masonry work involved by the construction of the bridge. In addition to the long approach viaducts there were the anchorages which were to bear the weight and strain of the giant suspension cables. Roebling placed these anchorages 930 feet inshore from each tower, in the form of enormous blocks of masonry, each covering 15,708 square feet of ground and containing 60,000 tons of stone and concrete. By May 1877, ten years after the company for building the bridge had been formed, the great piers and anchorages were ready for the stringing of the suspension cables. This work began during June of that year. The stringing was a difficult task. The cables consisted of about 200 miles of stranded wire, and the construction engineers had to carry them backwards and forwards between the two anchorages no fewer than 278 times. At the anchorages they passed each cable round a grooved iron block in the form of a horseshoe, and with the groove on the outside. There were four main cables, each made up of 5,282 oil-coated wires of galvanized steel. Each main cable had a diameter of 15¾-in. The tensile strength was 43,500 tons and the wire content 6,928,346 lb. One alarming accident took place on the Brooklyn Bridge during the stringing of the cables. This was when one of them broke loose during the operation of threading it round the grooved block at the anchorage. There was a loud report, and the loose end went over the top of the tower, 930 feet away, to fall with a great splash into the waters of the East River beyond. Apart from this frightening mishap - more an annoying delay than a disaster - the stringing of the cables was completed without major accident. HIGH ABOVE THE EAST RIVER, men in precarious positions bolted the girders of the deck to the vertical stays which hung from the suspension cables of Manhattan Bridge. The cost of building Manhattan Bridge was about £3,470,000. To support the bridge deck, the engineers of the Brooklyn Bridge used the normal vertical stays supported from above by the cables; they used also inclined stays radiating from the tops of the towers. The longest of these stays extend for a distance of 400 feet from the towers. The stays are strong enough to support the bridge unaided, in the almost impossible event of all the vertical stays failing at once. The Brooklyn Bridge was completed in 1883, and at that time had the longest single span in the world. With its approach viaducts it has a total length of 5,989 feet, or over a mile. 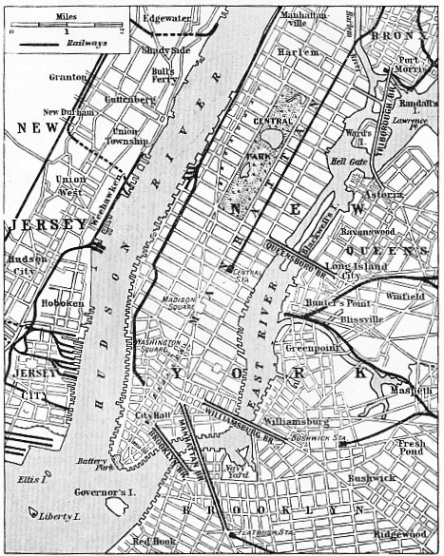 At the New York side it is connected with Chatham Square, Manhattan; its other extremity debouches on to the confluence of Sands Street and Washington Street in Brooklyn. On completion, its cost had amounted to £3,730,000 sterling, not counting the cost of the land on which it was built. Some years after the bridge had been built doubts of its stability were suddenly entertained in responsible quarters. An inquiry was held and it was found that the Roeblings had carried out their work in an unimpeachable manner. The design was perfectly sound, and certain disquieting symptoms of weakening were entirely due to neglect on the part of those responsible for the bridge’s upkeep, who had apparently assumed that the bridge, once built, could look after itself. Since then, for over half a century the Brooklyn Bridge has remained as a monument to the genius of the Roeblings, father and son, and to the dogged perseverance of their assistants, technician and labourer alike. For twenty years the great Brooklyn Bridge spanned the East River in solitary grandeur. Then, in 1903, the second great East River bridge was completed, another suspension structure known as the Williamsburg Bridge, stretching from Broadway, Brooklyn, to Delaney Street, Manhattan. The chief engineer of the Williamsburg Bridge, L. L. Buck, proceeded on much the same lines as John and Washington Roebling had done in building the old Brooklyn Bridge. The same Government restriction was in force, namely, that the bridge must allow a clear and continuous headway of 135 feet above high-water level. Buck, however, instead of using solid masonry for the superstructures of his piers, built them in the form of steel towers. His central span - 1,600 feet long - of which 400 feet were at or above the prescribed height of 135 feet, was longer than that of the Brooklyn Bridge and was exceeded at the time only by the Forth Bridge. As with the Roeblings, Buck had to carry his approaches for a long-way on either side of the river, and altogether the two approach viaducts cross over more than a mile of streets and houses. The total length of the bridge is 7,200 feet, and its overall width 118 feet. The capacity of the Williamsburg Bridge is considerably greater than that of the old Brooklyn Bridge, for its decks carry two carriageways for ordinary road vehicles, four tramways, two footpaths and two, elevated railways. Altogether, the main span of the Williamsburg Bridge contains 8,000 tons of steel, and the two suspension towers contain 3,000 tons of steel each. The bridge cost £3,400,000 to build, and when it was opened it carried the heaviest traffic of any bridge in the world. 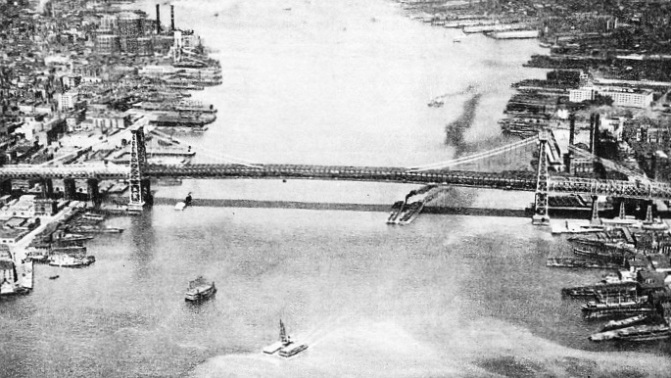 The spanning of the East River was going on steadily now, and the years 1909-10 saw the completion of two more giant structures connecting Manhattan with Long Island. These were the Manhattan Bridge, situated a quarter of a mile east of the Roeblings’ original Brooklyn Bridge, and the great Queensboro’ Bridge. 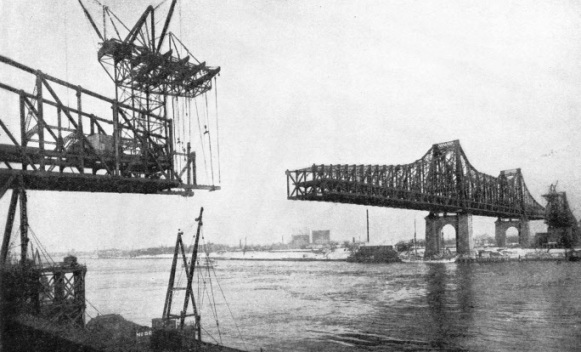 The original project for the Queensboro’ Bridge had been for yet another suspension bridge, but the designer finally adopted the cantilever principle, with three main spans instead of one. 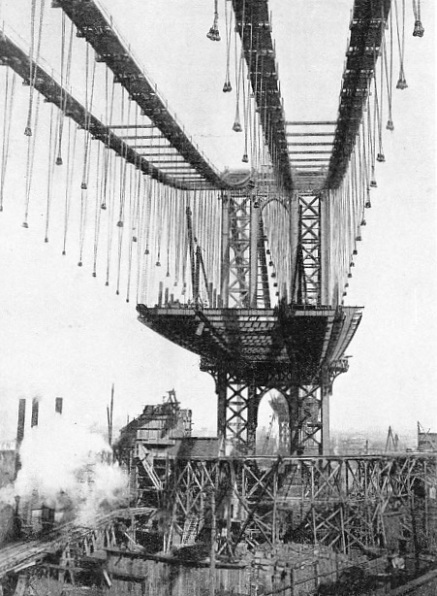 The cantilever principle was little known in the Roeblings’ day, but by 1901, when work was started on the Queensboro’ Bridge, the Forth Bridge was already tested and proved. Moreover, the river at the point chosen for the Queensboro’ Bridge was divided into two channels by Blackwell’s Island, on which it would be possible to mount two of the four cantilever towers. 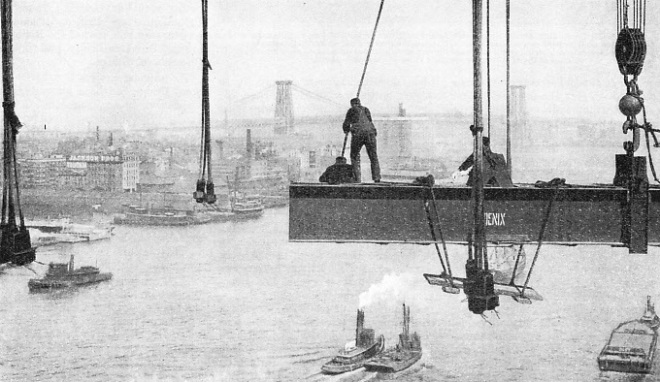 FALSEWORK was built across Blackwell’s Island to facilitate the building of Queensboro’ Bridge, but no falsework was allowed to be used across the river. The two central towers were supported on masonry structures and the cantilevers were built out over the river to meet the ends of the cantilevers extending from the opposite shore. 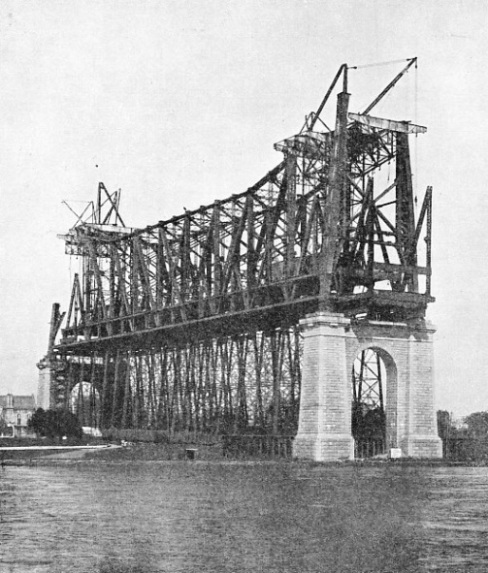 C. M. Ingersoll, the engineer of the Queensboro’ Bridge, was not, however, the first to propose a cantilever structure across the East River at Blackwell’s Island. At the beginning of the ’eighties such a bridge had been proposed and designs prepared. A contract had been awarded in 1881 for a bridge on this site, but the winning design was a suspension bridge, which the engineers had been unable to carry out. The design of the Queensboro’ Bridge is peculiar. The usual form of cantilever bridge, as best exemplified in Great Britain by the Forth Bridge and the bridge at Connel Ferry, near Oban, Argyllshire, incorporates a central span supported at either end by a cantilever arm built out from a perpendicular or triangular tower. The Queensboro’ Bridge has no such spans in all its length. In each of the three main spans, the designer carried out his cantilevers until they met one another, when they were connected up. Thus after each cantilever had been built out until it was united with its fellow, each span formed a single instead of a triple unit. The cantilever construction of the Queensboro’ Bridge is all above the level of the deck, instead of being above and below, as in the Forth Bridge, and the cantilever towers are supported below deck level by huge masonry piers. The trusses of the superstructure have depths varying from 45 feet in the middle of the east and west spans, to 185 feet at the towers. The same headway - 135 feet - is allowed for shipping, as in the other bridges. The designer did not build all his main spans to the same length. To base two of the four towers on Blackwell’s Island, he had to place the two island towers much closer to each other than to the end towers. This middle span is 630 feet long; the eastern channel span is 984 feet; the western channel span 1,182 feet; the eastern anchor arm 459 feet; the western anchor arm 469 feet. The total length of the cantilever spans thus amounts to 3,724 feet. The overall length of the Queensboro’ Bridge, with its approach viaducts, is no less than 7,425 feet. From the point of view of traffic capacity, the Queensboro’ Bridge was built on a large scale. Ingersoll built two decks, one above the other, providing for traffic inside and outside the girders. The lower deck has a 36-feet carriageway in the middle, with four railway tracks, two inside and two outside the trusses. The trusses are supported by cantilever extensions of the floor beams, a practice which modern engineers have since adopted in various places. On the upper deck there are four lines of railway between the girders, with two 12-feet paths for pedestrians outside, supported in the same manner as the outer rail tracks of the lower deck. The eight railway tracks accommodate main-line trains, elevated electric cars and street tramcars. The Queensboro’ Bridge was completed in 1909. In that year, however, shortly before the opening date, certain engineers of repute levelled grave charges at the principles of its construction, stating that it could not possibly carry the load for which it had been designed. There was at the time a scare about cantilever bridges, after the failure of the first Quebec Bridge during construction. Leading technicians in America and elsewhere talked and wrote openly of the “failure of the Queensboro’ Bridge”, and an inquiry was ordered. Then a number of other engineers, men with considerable reputations, came forward with a spirited defence of the great work, which had cost no less than £4,000,000 and had taken eight years and more to build. To-day, however, after many years, the Queensboro’ Bridge, with its huge cantilevers, still throws its solid length across the East River at Blackwell’s Island with an air of gaunt, uncompromising grandeur. TWO DECKS were incorporated in the Queensboro’ Bridge, which carries eight railway tracks, a 36-feet roadway and two 12-feet paths for pedestrians. The cantilever spans of the bridge extend for a total length of 3,724 feet, of which 630 feet are between the two central towers on Blackwell’s Island. The year 1909 saw also the last stages in construction of another great bridge across the East River between Brooklyn and Manhattan. Just as the first of this series of spans was called and has always been known as the Brooklyn Bridge, so was this fourth addition to the New York giants simply named the Manhattan Bridge. Those responsible for the Manhattan Bridge kept to the traditional suspension principle, and the total cost of the bridge amounted to £3,470,000, over half a million less than that of Queensboro’ Bridge. 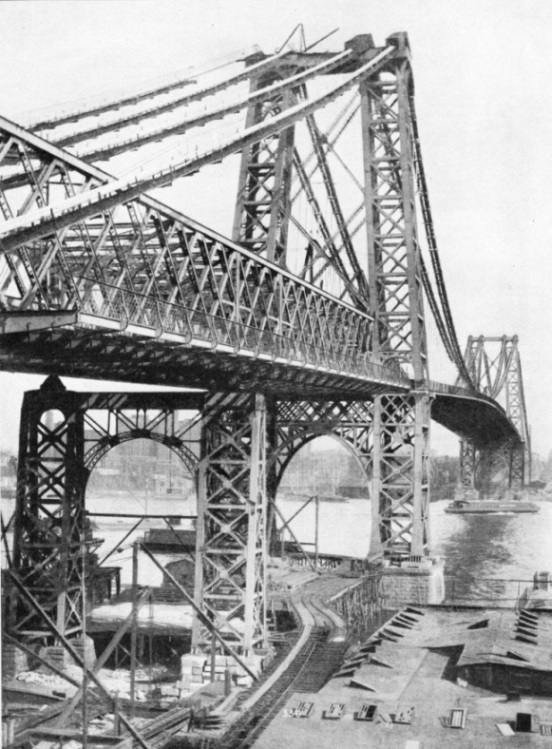 The designers of the Manhattan Bridge did not consider that it was necessary to carry the foundations down to bedrock, and A. Johnson, the Consulting Engineer for the bridge, estimated that completely adequate support would be afforded by caissons resting on the mixture of sand and boulders lying between the virgin rock of New York and the bed of the river. They placed the two great anchorages on a foundation of piles driven far down into the sand and gravel on either side of the stream. Manhattan Bridge has a shorter central span than the two older suspension bridges across the East River. The distance between the two great towers is 1,470 feet, the total length between abutments being 2,920 feet; the width is 120 feet. Here again, there are two decks, carrying between them roadways, footpaths and railway tracks. The towers and cables are of steel. The caissons supporting the towers penetrate the river bed to a depth of approximately 92 feet on either side. The bottom edges of the caissons are 92 feet below high-water level and a little over 60 feet below the bed of the East River. Penetration to the underlying rock would have necessitated abnormally deep boring at this point on the river, and the engineers convinced themselves, by trial borings, that the intervening gravel and boulders were safe so long as they were pierced to a sufficiently low level. The cables contained no fewer than 30,000 strands of stout wire, and the anchorages, in contrast to the towers, were built of masonry. One disconcerting accident took place on March 25,1910, just before the bridge was due to be officially opened. This was a fire which broke out among the asphalt kettles used for paving the road surface. The asphalt blazed up rapidly, and in a short time the fire spread to the sleepers and the long timber guard-rails supporting and curbing the railway tracks. By these it spread along the bridge, buckling the floor steelwork, though the main superstructure was undamaged. A more disquieting hitch had occurred the year before, when the Queensboro’ Bridge scare, itself endangered by the failure of the Quebec Bridge in Canada, was in full blast. Not only the Queensboro’ Bridge, but also the more orthodox Manhattan Bridge was attacked by experts who questioned its safety. 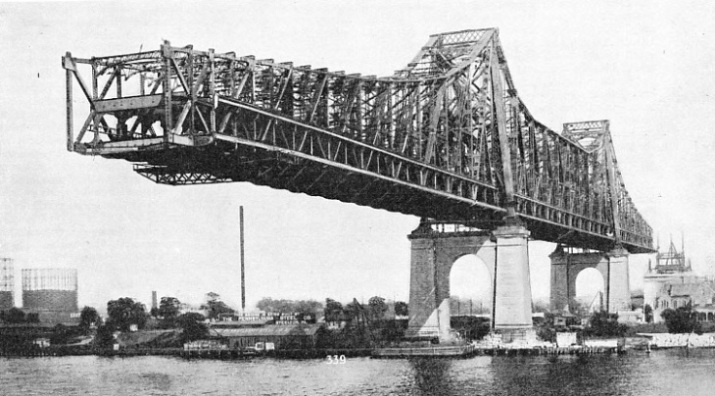 The engineer, Ralph Modjeski, whose name is familiar enough to-day in connexion with the great Huey Long Bridge at New Orleans, was instructed to subject the Manhattan Bridge to a most searching examination. Modjeski went over the works, and in due course produced a voluminous and detailed report. Certain features of design he certainly criticized - it is seldom that two experts see absolutely eye to eye - but, in the main, the Modjeski Report vindicated the builders of the Manhattan Bridge. The latest addition to this great series of bridges is the Triborough Bridge, so called because it links the three boroughs of the Bronx, Manhattan and Queens. The bridge runs roughly parallel to the steel arch of the Hell Gate railway bridge and its overall length is three and a half miles. New York can no longer boast that she possesses the “largest bridge in the world”. But the four great structures which are described in this chapter have established her claim to being, above all others, a city of giant bridges, and the newer spans which have been built in more recent years make that claim a stronger one than ever to-day. THE MAIN SPAN of Williamsburg Bridge contains 8,000 tons of steel and the two suspension towers contain 3,000 tons of steel each. The bridge has a total length of 7,200 feet; a great proportion of which is carried over streets and houses on either shore. When opened the bridge carried the heaviest traffic of any in the world. 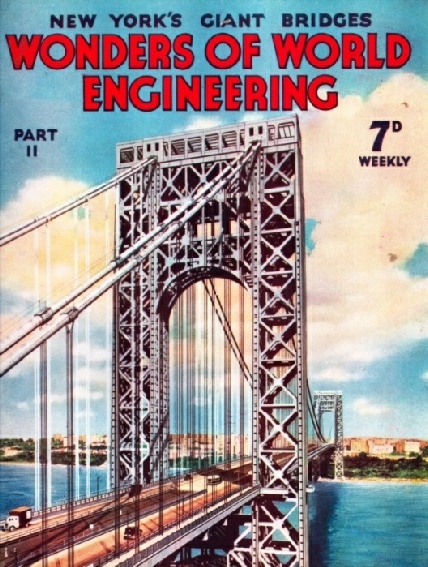 The cover to this part shows the George Washington Bridge, one of the most recent of the huge bridges which are such a prominent feature of New York. Completed in 1932, the bridge spans the Hudson River between Tenafly, New Jersey, and Washington Heights, New York.